Singapore, 22 May 2018 — Come July 21 this year, Pink Dot SG, Singapore’s landmark LGBTQ-affirming event, marks its milestone tenth edition with an expanded array of activities and a strong message to Singaporeans. To demonstrate this, festivities and activities leading up to Pink Dot 10 will revolve around more active community participation. Also in line with having a greater community presence, Pink Dot 10 will also see the roll-out of three community-led campaign videos by three notable local filmmakers: Christopher Khor, Quen Wong and He Shuming. All three campaign videos focus on continuing challenges faced by LGBT individuals and families, told from the perspectives of a teenager behind the Love, Simon petition, a mother-and-daughter volunteer team, and a queer person from a Malay-Muslim family. Continuing from its successful debut last year, Red Dot for Pink Dot returns with another fundraising drive, calling on corporate Singapore to continue taking a stand for inclusion and diversity. With a current tally of more than 60 local sponsors, the initiative continues to be led by Darius Cheung, founder of 99.co, with other business leaders including Ho Kwon Ping (Executive Chairman of Banyan Tree Holdings), Adrianna Tan (Founder of Wobe), Gwendolyn Regina (Founder of SGEntrepreneurs), Royston Tay (Founder of Zopim), Goh Yiping (Venture Partner, Quest Ventures), and Mohan Belani (Founder of e27) joining him to champion the initiative. On-event, Pink Dot 10 will also incorporate some logistical changes to its overall layout at Speakers’ Corner. The event will continue the last year’s use of barricades and check points and attendees will still be required to show photo ID (pink/blue NRIC or passport) to volunteers and security personnel before being admitted into the park. This year, attendees will come in through one dedicated entrance with twice as many checkpoints as the previous year. The Pink Dot Concert will also be hosted on a purpose-built stage as Telok Ayer Hong Lim Green Community Centre undergoes renovations. Look forward to headlining local artistes declare their undying support for the Freedom To Love through song. A major mainstay, the Pink Dot Community Tent will continue welcoming 25 LGBTQ community and support groups. As always, each group brings their unique brand of love and support for the LGBT community, and attendees to Pink Dot are encouraged to visit these groups and learn more about them. 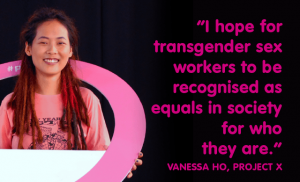 Organisers invite all Singaporeans and PRs to come down to Pink Dot 10 and stand strong together for a truly inclusive Singapore on Saturday, 21 July 2018. Watch our 2018 Campaign Videos and more on YouTube.